All innovative measures introduced by the state to tame the rapid degradation of forests in India has not been able to generate positive impacts. These measures could neither halt the pace of degradation nor slow it down significantly to regenerate the lost resources. The results first. 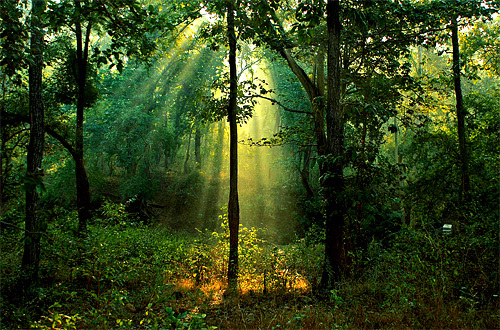 The 2011 Forest Report indicates that 21.05 per cent of the total area in India is comprised of forests. Between the period 2009 and 2011, while some of the states have successfully added to its forest cover, the loss of forests coverage in most other outweighed these additions. The overall loss has been estimated at 367 square kilometres in India. Among these states Andhra Pradesh, Manipur and Nagaland lost more than 100 square kilometres, only the state of Punjab gained a 100 square kilometres forest coverage during the same period. In both the north eastern states the decrease is attributed to shortening of shifting cultivation and biotic pressure. In Andhra, which witnessed the largest decline, it was attributed to management interventions in cultivation and clearing of encroached areas. Kerala lost 24 square kilometres of forest during this period. Illicit felling was reported only in the state of Assam. Most of these decline was in the open forest category while the dense forests gained in coverage area. Garret Hardin’s famous coinage of the “tragedy of commons” has theoretically provided space for justifying the role of the state as well as private players in managing the overuse and degradation of forests. In fact the theory is applicable to all natural resources where out of sheer self-interest, a private individual will always have the motive to exploit unsustainably. Several alternatives were suggested to prevent such exploitation. However, broadly it represented an allocation problem where either the private individual or the state legally assumed the task of managing these resources. In modern times what we have seen is that the state that has ultimately assumed a monopoly power in regulating activities connected with the forest. A key libertarian argument against restrictions by the state is that state officials who implement restrictions in using these resources is not affected by the cost of their action. However, if the rights of using the forests or natural resources are allocated to private individuals, they would surely have to bear the costs of their decision on how to use it. It then follows that the private individual would have more incentive to optimally use these resources and thereby reduce the cost that he has to bear. The Centre for Public Policy Research (CPPR) tries to expand this idea in the context of India to develop our forest coverage through letting individuals bear the benefits and costs of their decisions. In recent times environmental protectionists have pitched themselves against the advocates of economic growth. Trade-off between environment and growth has been a major political plank for various institutions and groups who participated in this tiff. CPPR believes that economic growth is inevitable and necessary to sustain the ever growing demands of the humans. The level of scientific development that we have achieved today is a sure measure to tackle most of the environmental concerns that we face. As we move further the solutions to environmental concerns would develop through innovation and technological progress. However, if environment is projected as a concern to stall growth, it is highly likely that the progress of human civilization is likely to be intercepted. The law should go beyond prosecution and legal sanctions and restrictions for that matter, and evolve a system where there are incentives to protect the forest. And if these incentive are in monetary terms that will attract more people to participate in owning and using forest sensibly. Beyond the private individual,communities or other interested parties could participate in these initiatives and have a stake in the process. The reasoning should be the same as for the individual. A major contribution should be made by the governments at the local level. Centralization of Acts and Policies have also build a space where officials never were compelled to own responsibilities of their individual acts. Greater stake for local level government would make the process more transparent and would raise the standards for ownership. Forests would thus serve the dual purpose of providing a shield against environmental concerns as well as in developing a pool of wealth and resources for its owners. The results are obvious. Private ownership would not only allow individuals to value natural resources and protect it for their own sake but also would make them equally responsible for its degradation. The flip side is that these resources would become an income earning asset for its holders. Of course what prevents this situation is the several road blocks and inefficient laws which exists currently and the over enthusiasm of the state in holding on to these forest resources. We have reached a point where the monopoly of the state is assumed as natural as these are natural resources. This has prevented individuals from accessing and using forests more creatively.What is required is to break free these notions.